MS Outlook email attachment extractor tool is used to extract multiple attachments from Outlook PST files in an easy manner. MS Outlook users receive and send a lot of emails with attachments in their routine organizational life. But management of email data along with email attachments is complicated task. ANSI PST file users have limitation of storing only 2GB data which may restrict them to receive or send emails if storage limit exceeds its size. Moreover, crossing a size limit may also result in corruption of PST file in Outlook. In this situation removing attachments from multiple emails in Outlook may help to shrink the PST file size. Now the concern is all about how to extract attachment from emails file in Outlook. Opening all email files one by one is not a good idea as it will consume a lot of time. On the other hand users who have thousands of emails may not be able to complete this task in hours, days and week. How To Extract Attachments From Emails in Outlook? 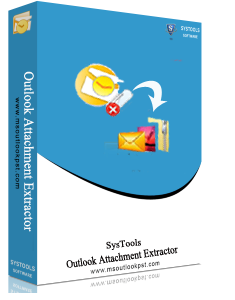 Outlook Attachment Extractor software is the best solution in online market which helps to extract multiple attachment files from Outlook PST files in simplified manner. The MS Outlook email attachment extractor tool helps to extract and save all email attachments into single folder/location. ⇒Folder Hierarchy: By using this option user can save their email attachments folder wise. For example the software will save the attachments of inbox folder into folder named with inbox, outlook box attachments to outlook folder etc. ⇒Folder Hierarchy (Subject Wise): This option will save the email attachments according to the subject of their emails. For example the attachment of mail with subject named 'Apple' will get saved with 'Apple' name only. ⇒No Folder Hierarchy: This option will save the email attachments randomly according to it. All the attachments will save randomly into the desired location where user chooses to save the attachments data. The demo version of MS Outlook email attachment extractor will help user to extract first 20 attachments from 5 PST files at free of cost. The demonstration of tool will help user to judge software abilities before investing into tool.